-Sri Lanka: journalist A.R.Vaama Loshan arrested under anti-terrorism law. Amnesty International says arbitrary detentions and attacks on journalists have increased with rising tensions between government and rebels. -Saskatchewan: Labour Relations Board rules that unfair labour practices suit against Walmart will go forward, despite the company’s claim that the Board was overstepping its jurisdiction. UFCW accuses the retail giant of intimidating workers by shutting down a unionized store in QC. – Washington DC: Protestors demonstrate outside World Bank HQ; Bush defends principles of free-market capitalism; Group of 20 largest economies call for more cooperation on financial regulation and agree to 47-point plan. -Montreal: McGill Chancellor Richard Pound draws more criticism for characterizing aboriginal people as “savages” in an interview: protestors take to Montreal streets; McGill student’s society votes against calling for his resignation. -Group of 20 industrialized and emerging nations meet to talk about reshaping global financial system and giving greater voice to developing countries. -Fort Chipewyan, Alberta: Aboriginal leaders and health board reject province’s study of cancer rates in community downstream from oilsands development. –Canadian aboriginal people, and an international coalition of scientists and tourism operators call for a global moratorium on salmon aquaculture as fish populations decline. -Quebec provincial election: Green Party of Quebec and Quebec Solidaire demand participation in televised debates. 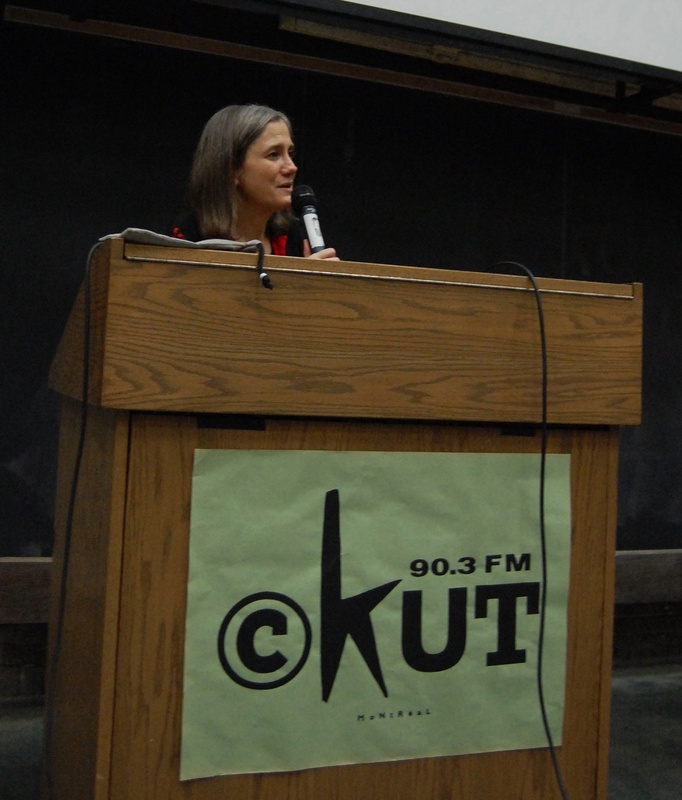 On Friday, just days after the election of Barack Obama as president of the United States, Amy Goodman was in Montreal, speaking about independent media, war and elections. Before going onstage to address an audience of hundreds at McGill University, Goodman sat down with CKUT to discuss community radio, Obama, and the world today. The full interview with Amy Goodman is HERE (runs 10m 13s). Goodman is a best-selling author, an award-winning journalist and the executive producer and host of the daily news hour Democracy Now! In her talk Friday night, she related narratives like the arrests of journalists, including herself, at the 2008 Republican National Convention. A compelling storyteller, she linked her experiences to an incisive account of America and the world. It was all part of the international symposium of the World Association of Community Radio Broadcasters (AMARC). For this event, programmers from around the globe converged on Montreal, marking AMARC’s 25th anniversary. -World Bank president announces cancellation of millions of dollars of Haiti’s massive debt; critics say his comments were misleading. -IMF delays Haiti’s entrance into the Heavily Indebted Poor Countries inititative. -Quebec announces cuts in greenhouse gas emissions for fourth straight year. -As Jim Prentice becomes Minister of Environment, the Conference Board of Canada reports that Canada is among the worst industrialized countries for environmental standards. -200 protestors march against oil sands development at Fort Chipewyan in Northern Alberta. -President of International Trade Union warns that migrant workers could be the first to lose jobs in global financial crisis. -Barack Obama elected president of USA in historic election. CKUT gauges public reaction to the news at Montreal universities.